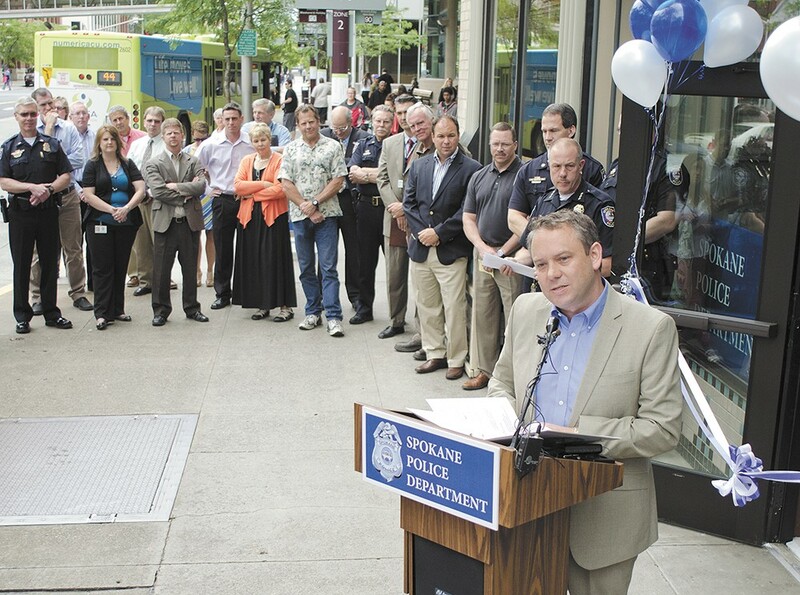 Mayor Condon at the 2013 ribbon-cutting, officially opening SPD's downtown precinct. It probably doesn't matter where the Spokane police downtown precinct is located — or at least that's what Interim Chief Rick Dobrow has said ad nauseam. "The physical location of the precinct is probably one of the least important factors in the crime reduction strategy downtown," he says. "It's where we place our assets." What does matter, though, is effective use of city and taxpayer money, transparency with the public and open lines of communication between City Hall and its partners in the business community. That's why if he could do things over, Scott Simmons, the recently appointed head of the Public Works Division, would give the stakeholders invested in a police presence downtown a heads-up about his division's plans to move the police precinct from the Peyton Building to the Intermodal Center. As the former director of the Business and Developer Services Division, it's his call to make the move, but he says he made the final decision with input from two asset managers, two former police executives, Dobrow and Assistant Chief Craig Meidl. Not included in that decision, or notified when it was finalized, was the Spokane Transit Authority, the Downtown Spokane Partnership and the city council, all of whom had a financial interest in it. Also, in February 2015, former Police Chief Frank Straub told city councilmembers that the Intermodal Center would open as an additional precinct, not a replacement. In October 2015, a month after Straub was fired, councilmembers were then told the precinct was moving to save the city money and make better use of city-owned property. On Jan. 21, in a written response to questions from the city council about the move, city and police leaders said "potential cost savings has been discussed as part of this move to Intermodal, [but] it was not the core reason for the decision." Then on Jan. 26, Simmons told the Inlander that as far as he was concerned, the Intermodal Center had been planned as a replacement facility since March 2015. "That is a change in the story," City Council President Ben Stuckart says. "When we were briefed and approved capital expenses, Straub's plan was always for [the Intermodal Center] to cover the lower South HIll, and we weren't closing the downtown precinct." In June of 2013, Mayor David Condon stood outside the soon-to-be-opened downtown police precinct right next door to the STA Plaza. "I've never met a pair of scissors I didn't like," Condon said before cutting the blue and white ribbons with a pair of huge scissors. He went on to praise the partnership between the city, STA, the Downtown Spokane Partnership and the owners of the Peyton Building, without whom the newest effort in community policing would not be possible. "It's exciting to be in partnership with the DSP, and a personal thank-you to Mark Richard," he said, referring to the DSP president. "You're new to the team, but you've definitely hit the ground running." Those partnerships allowed the police to open a precinct downtown while paying no rent and getting funding for a full-time officer. DSP arranged for nearby businesses to pay $2,400 in monthly rent, and STA kicked in the equivalent of a full-time officer's annual salary, as it has done for 10 years. In 2015, that amount was $86,900. For Straub, that was only the beginning of a larger plan to open several precincts throughout the city and eventually vacate the department's headquarters in the Public Safety Building. Fast-forward to Feb. 17, 2015: Straub told city councilmembers that funds to renovate the city-owned Intermodal Center would allow him to open an additional downtown precinct. On March 23, 2015, Simmons made an official request to the city council for $147,832 to renovate the space. (Renovations ended up costing $113,518). In his mind, that meant the precinct would relocate after the remodel was completed. Simmons did not specifically say that, and council members did not ask. Stuckart and Councilwoman Amber Waldref say they voted to allocate that money for an additional precinct, and might not have done so otherwise. In September, Straub was removed as police chief, and Dobrow announced the next month that Straub's plan to decentralize the force into precincts was not feasible for a city this size, and the Intermodal Center would replace the precinct at the Peyton Building. "That's not realistic in Spokane," Dobrow tells the Inlander. "We don't have the capacity financially, nor with our personnel. We're just not large enough." Richard, the DSP president, then testified in front of the council on Oct. 26 that he hadn't heard a thing from the city or the police, and he was concerned that businesses downtown would be paying rent for an empty space that the police agreed to occupy. "That deeply concerns us," he told council members. "We're striving to have a productive meeting with the police chief and with the administration to try and resolve that." He wasn't the only one left in the dark. Councilmembers also heard about the move in October. Susan Meyer, CEO of STA, says that she and her board didn't hear until November. The move negated the agreement between STA and the police, which means that at the same time Dobrow says the department is struggling with staffing, he's losing funding for an officer. And since the police pulled out of the Peyton Building before the lease ended in May, the city is now paying DSP $2,400 a month in rent for a space they're not occupying, Simmons says. Stuckart and Councilman Mike Fagan submitted a list of seven questions to city and police leaders during a Public Safety Committee meeting earlier this month. In short, they wanted to know: Who made the decision to move and when? And how will the move save the city money? During a news conference last week and in documents provided by the city, they received incomplete and misleading answers. At no point during the news conference or in the documents was there any mention that the city intended to move the downtown precinct to the Intermodal Center in March 2015. Instead, Simmons told reporters gathered in front of the newly renovated space just inside the Intermodal Center that the move was part of the city's effort to occupy city-owned buildings. The documents provided to the city council and reporters that day imply that an "STA lease" was expiring at the same time the remodel of the Intermodal facility was completed. "This left the City in a position that one of the facilities was going to remain vacant, Peyton or Intermodal," the documents read, making it seem like the two events were serendipitous. But that's misleading. The "STA lease" is actually the transit authority's agreement with SPD to fund an officer. The sublease DSP was paying for, on the other hand, wasn't up until May 2016. The documents go on to say that "in a February 17, 2015 Public Safety Committee meeting, then-Chief Straub did present that the police division would be keeping both the Downtown Precinct and the Intermodal facilities for police. Upon further review, it was determined that the police division could not support maintaining an officer in both facilities due to patrol coverage needs. That decision was communicated and briefed during an October 19, 2015 meeting of the Public Safety Committee." Stuckart says he was looking for more of a cost-benefit analysis and justification for why the move made financial sense. "It seems like we could have kept the [precinct] going in the Peyton Building with all the partnerships," Waldref says. "We could have always done something different with that space in Intermodal." As Dobrow answered questions during the new precinct's grand opening last week, he put on a smile while he repeated for the third time in two weeks that policing downtown won't change. Most of the renovations are finished, and the desks are empty, which isn't unusual. The five cops who report to the downtown precinct on a daily basis are out in the field. But there's one desk that's markedly empty: their leader's. Brad Arleth, the precinct captain, was put on paid leave Jan. 4, soon after the move. Dobrow's decision to do so has placed the move under even more scrutiny. The allegations against him stem from a complaint for a "serious violation of policy," and go beyond the rumored squabble over moving furniture between precincts, Dobrow says. Although he wouldn't name the complainant, Dobrow tells the Inlander that "we became aware of things from people that work within the city and the complaint was generated at my direction." He offered no more specifics. As for the agreement for the extra officer from STA, there's no new deal in the works. Steve Blaska, STA's director of operations, says they're in a holding pattern as to whether or not the organization feels it needs to continue providing funding. "We'll huddle again, and we have options," he says referring to ongoing discussions with the police department. "Unfortunately, I think we've lost sight of the fact that the good news is we have a precinct downtown. That's gotten lost in the noise." For his part, Simmons says he's committed to having quarterly meetings with the DSP and other partners downtown.